Alhamdulillah this was a little project my son (8) and I did last night. We used mostly supplies that you can purchase at most dollar stores. The fanciest material we used were some embossed cardstock that was made using Cuttlebug. This was a special card for NaniMa. He used tearing technique for the blue paper. 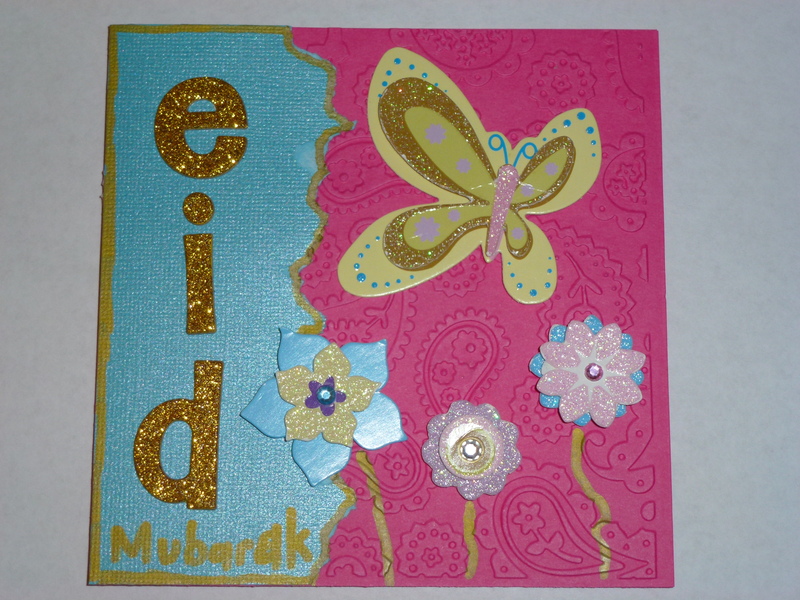 He pasted some butterfly and flower embellishments, stickers for the word Eid and used a gold marker to highlight and fill in some details. The pink cardstock was embossed. 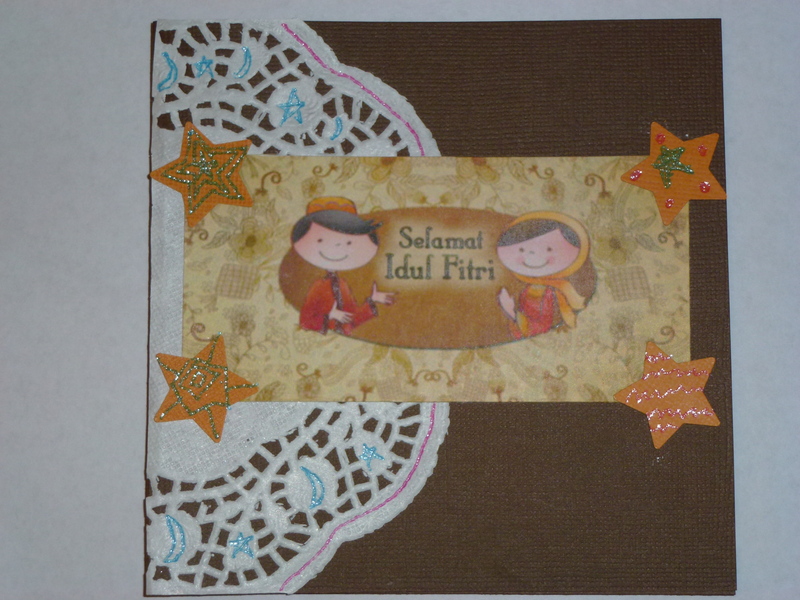 Jannah Steps featured some Eid Card templates that was done by artist Melani Putri. For this card though I printed the greeting from Memelograph, Melani’s own blog. We use the same greeting in Malaysia with a slight spelling variation, so this works well. DS1 chose to use a paper doily for this card. He then added details using gel pens that he has been getting in his advent calendar this year. He also used a craft punch to make stars as anchors for the greeting. 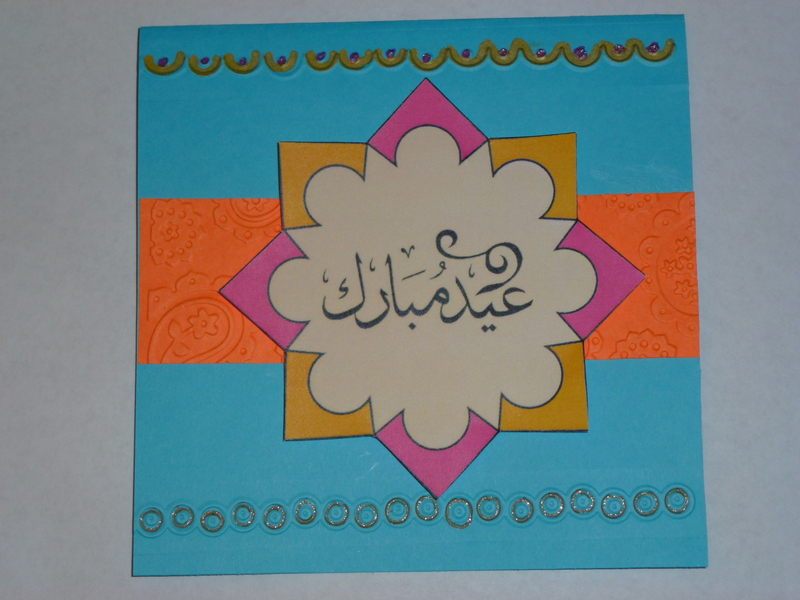 The centre of this card was from an Eid card template from Jannah Steps. There are embossed details on the top, middle and bottom part of this card. DS1 then highlighted them with a gold pen. He then pasted the greeting in the centre as the focus of the card.